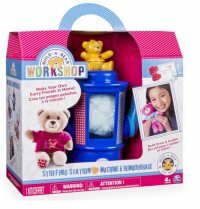 Build-A-Bear Stuffing Station is currently in short supply, however we constantly track for stock to ensure you will be the first to know when availability is found. Buy from Amazon USA for $29.99 (In total works out around £36 with UK delivery and extra charges). Exactly the same Build a Bear Station as you would buy in the UK. We constantly check for Build-A-Bear Stuffing Station stock, so you don't have to. Receive email alerts when Build-A-Bear Stuffing Station online stock is found.